Tracy Colunga (MSW ‘01) has been named the Joseph A. Nunn Alumna of the Year for the Department of Social Welfare, an honor granted each year to an alumnus from the department at UCLA Luskin. Colunga has been working tirelessly in community development and safety for the city of Long Beach since joining Development Services in 2012. 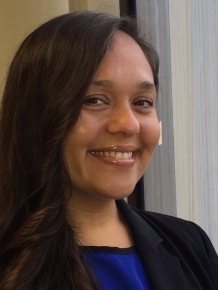 As part of her current role in the Neighborhood Relations Division, Colunga oversees the Safe Long Beach Violence Prevention Plan, a program that facilitates community discussion and provides resources for creating long-term safe environments in the city. Colunga has worked to secure major grants for community safety and neighborhood livability gaps, such as the planning grant from the California Endowment which funded the Violence Prevention Plan in its first stages of development. Beyond her work in Development Services, Colunga’s involvement with the community extends to her role on the Board of Directors with Goodwill Serving the People of Southern Los Angeles County and as organizer for the annual EmpowerHER Young Women’s Empowerment Conference for girls who are in foster care, on probation, or at-risk in Long Beach. For the past eight years, Colunga also worked as a field instructor for the Luskin School and recently taught as a part-time lecturer in the Social Work Program. Colunga will receive her award at the Social Welfare Alumni Gathering on Saturday, May 9th at the Blue Cow Kitchen & Bar from 5:00-7:00 pm. Those interested in attending should RSVP by Thursday, May 7th.